Kourier Integrator has been used to create predefined Operational Data Store (ODS) solutions that provide the fastest way to get started with SQL Server data warehousing. These ODS solutions are ready to use and include everything needed to create and maintain a normalized SQL Server data warehouse that you can use as the basis for developing custom reports or as the foundation for a more complete business intelligence and executive dashboard solution. Each ODS is fully customizable to meet your unique needs and includes key data files from the associated application. 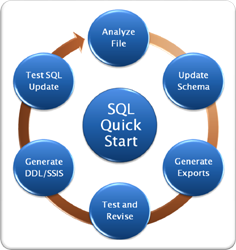 Also included are pre-defined Kourier Integrator SQL Export Specifications, Export Subroutines, System Literals, Email Templates, Services and Schedules. Kourier has also been implemented with many other U2 applications listed in the compatibility section below. Kourier Integrator was written specifically for the UniData/UniVerse (U2) extended relational databases (from Rocket Software), and is designed to make MultiValue integration and SQL data warehousing very easy. With Kourier your MultiValue application will be able to connect and exchange data with virtually any application and database available. Call us if you have an application that is not listed above, there's a good chance we have worked with it. Kourier Integrator solutions have a rapid and guaranteed implementation. Using our data warehouse Quick Start Workbench (or pre-configured Operational Data Stores) you can have a data warehouse or other integration project up and running in as little as one week! The solution pricing includes all the software and services needed for a complete data integration solution, and we'll even help you with your first project. Note that Kourier Integrator solutions are normally installed on your servers (application, web and SQL database) and must meet certain minimum requirements, contact Kore for details. MultiValue integration solutions that breathe new life into your enterprise applications. Contact Kore Technologies and let us know how we can serve you!